You are currently browsing the tag archive for the ‘Dionysus’ tag. Sometimes I discover pictures of extremely beautiful items of immense interest on the internet, but there isn’t much information with them. That is the case for this gold diadem which was discovered in a Greek tomb at Madytos by the Hellespont. The exquisite beaten gold crown was probably made in 300-350 BC by master goldsmiths of the Hellenic era. It features the marriage of Ariadne (the princess of Crete who rescued Theseus) and Dionysus, the only Olympian deity born of a human mother. Dionysus and Ariadne each hold their own thyrsus, a cult object betokening the divinity of Dionysus (usually they are seen in art in the hands of frenzied maenads, but the royal pair are too august to be thus besotted by sacred wine). Around the couple are exquisite floral motifs of field, farm, and forest wedded together. A pair of lyre players (one off screen to the left) serenade the apotheosized gods while doves strut at their feet. It is a beautiful crown…however since it has spent 2300 years lying in a tomb there is not much to say of its story other than what you can see for yourself writ in imperishable gold. 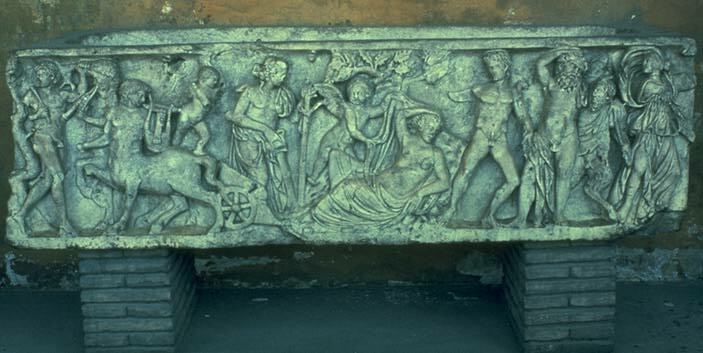 In the Greco-Roman cosmology, the underworld was a fearsome place not just for mortals, but for the gods themselves. For one thing, only a handful of deities had full freedom of passage to the realm of the dead. Hades reigned there and could come and go as he pleased (though, like a grumpy rich man, he seldom left his dark palace). 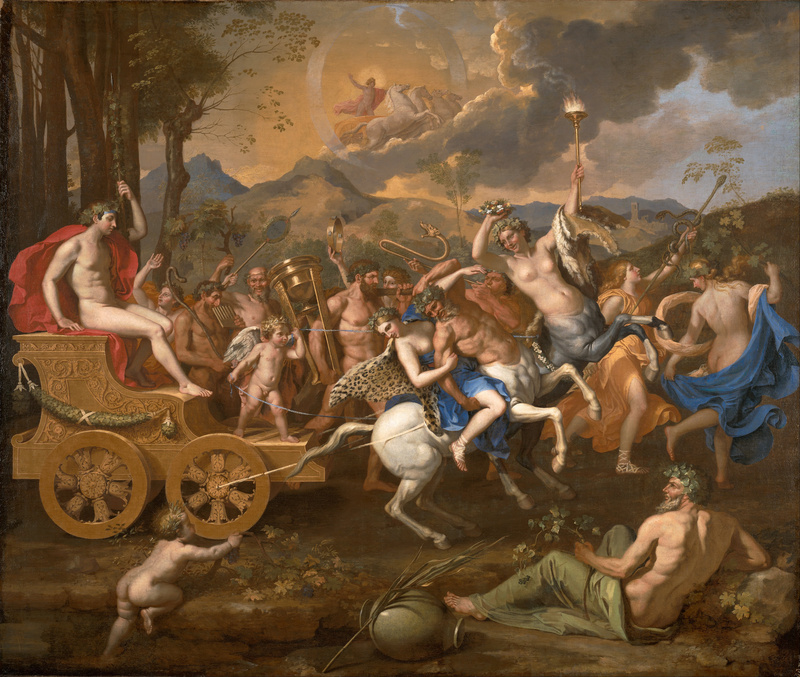 Persephone’s annual journey to Hades and back defined the seasons. Mysterious Hecate, the goddess of magic and thresholds could go anywhere at all, as could Hermes, the fleet-footed messenger of the gods (and the psychopomp who guided departed spirits to the final door). Nyx, alien goddess of primordial night, existed before the underworld…or anything else…and will exist long after. Although his retirement palace was in Tartaras, the deposed king of the gods Cronus/Saturn seems to have been free to roam the firmament. The Erinyes, spirits of furious retribution could temporarily leave the underworld only in order to goad their charges there…and that is about the full list. There were a lot of deities imprisoned in the underworld and there were lesser deities who worked there…but they were permanently stuck. Feasibly the Olympians, the most powerful gods who ruled heaven, the seas, and earth, could enter the underworld and leave again, but they never deigned to do so. 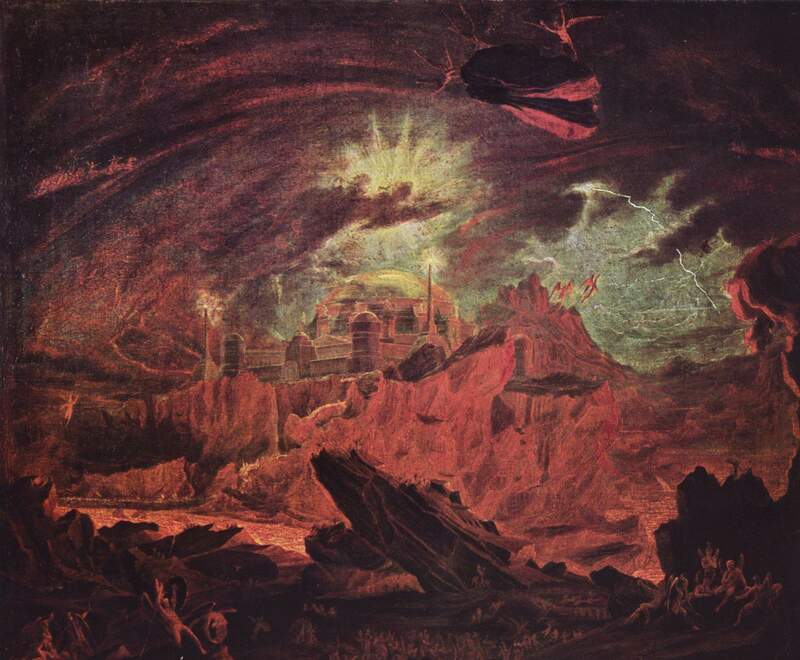 Gaia had the underworld within herself, so she stands beyond the paradigm (and perhaps the abstruse children of Nyx do too…but they were tangential to classical myth). There is of course an important exception. One Olympian god was the child of a mortal mother. Because of this human origin, and due also to his fundamental gifts and nature, he took the heroes’ journey and went down into the realm of the dead. Here is the myth. I have hesitated to tell it before for personal reasons: this god is one of my two favorite Greek gods but he is also my least favorite—the rewards, delights, and downfalls of worshiping him are all too evident! Semele was a beautiful princess. 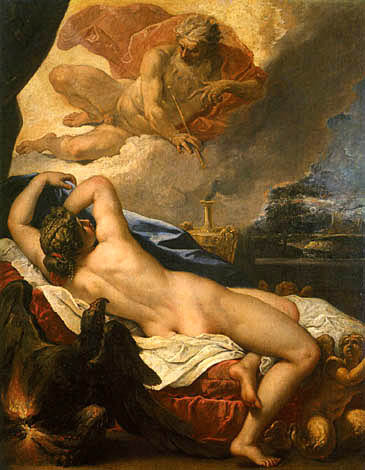 From heaven Zeus spied her beauty: he courted her and won her heart (without using subterfuge or force), but, unfortunately, his lack of guile allowed jealous Hera to easily discover the affair. The angry queen assumed the guise of an ancient crone and paid a visit on the lovely young princess. The crone flattered the princess and fussed over her whims until Semele was convinced the old woman was a dear friend. Then Hera asked who the father of Semele’s unborn child was (for the princess was just beginning to show her pregnancy). “The father is none other than mighty Zeus, king of all the gods,” announced the princess. Doubt grew in Semele’s heart. Who was her handsome lover, really? When next he was in her arms, she resolved to find out. Using all of her beauty and wiles she cajoled Zeus and beguiled him and convinced him to promise her a boon. She even made him swear on the River Styx–a sacred oath, binding even upon the gods. “If you are Zeus, show yourself to me in all of your divine splendor!” she demanded. Zeus equivocated and explained. Finally he outright begged to be free of his promise, but Semele was adamant: he had sworn an unbreakable oath. Sadly Zeus selected his smallest thunderbolt and gathered his most quickly passing squall. For an instant only, the sky father revealed himself as a force of nature with all the power and glory of the heavens, but an instant of such revelation was too much. Semele was burned away and only a pile of ash remained…and a pre-term baby. In horror and sorrow, Zeus grabbed up the little fetus. He hacked a hole in his “thigh” and sewed the tiny demigod into his own body (online classicists have informed me that “thigh” is a euphemism which decorous 19th century myth writers used for gonads). Then he set off for Nysa, a valley at the secluded edge of the world. The king of the gods knew exactly who was responsible for Semele’s death, and he wanted his son to grow up free from Hera’s wrath. When Zeus reached Nysa, he gave birth to Dionysus directly from his “thigh.” Zeus then gave the beautiful infant to the wild nymphs of Nysa–the maenads–to raise. The maenads brought the child up with their own intuition, wildness, and delirium. Leopards and tigers were his playmates. At the eastern edge of the world strange indecipherable noises could sometimes be heard. Grapes grew there too in superabundance, and the child demigod realized how to make them into sweet intoxicating wine. He grew into an inhumanly beautiful adolescent. Then he clad himself in glorious purple robes and began to make his way through the world towards civilization (which, coincidently for this Greek myth, was Greece). Everywhere Dionysus went he brought the secret of wine making. 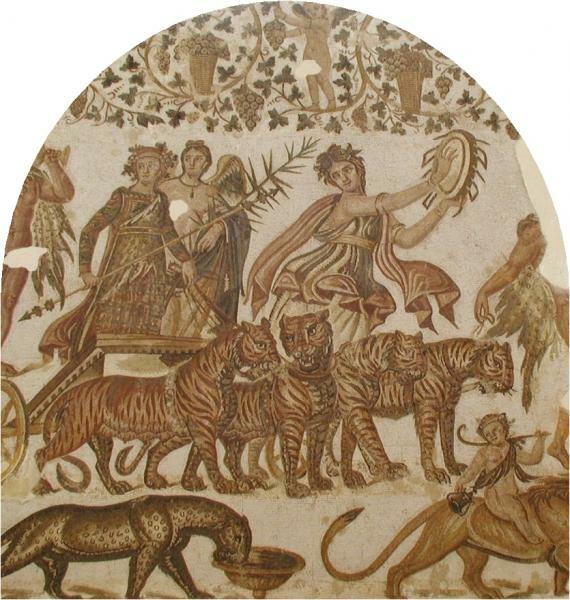 Sometimes he rode in a leopard drawn chariot with throngs of naked maenads running before him wildly singing his glory. Other times he revealed his divine nature to humankind differently—more subtly…or more strangely! But the ecstasy, beauty, and power of his gifts of inebriation always became readily apparent. Dionysus grew into the god of art, fertility, drama, and creation, but there is delirium, madness, anti-creation, and an orphan’s violent sadness to him as well. In his wild youth as a demigod in the mortal world, Dionysus had many adventures (in fact, we’ll circle back to some of these stories in later posts). Although he was powerful, he was youthful, delicate, graceful, and kind. Clad in purple robes, half-human & half-divine, asking us to drink his wine of revelation…he seems terribly familiar. At the end of his pilgrimage through Greece he came to Olympus and he effortlessly ascended up it to join his father among the other gods. His divinity was obvious to all. Hestia stood up from her throne and offered it to her nephew and went over to take a place at the hearth. Hera gritted her teeth and plotted how to win other battles. Zeus beamed and asked his son if there was anything he wanted as a gift on the special occasion of his apotheosis. For all of his wild delirium, Dionysus was a kind god…and an orphan. He plaintively asked his father if he could see his mother. Zeus readily assented…and then some. He told Dionysus to go get his mother and to bring her back to Olympus. And so it was. Dionysus went to the underworld and took his mother’s spirit away from ignominious death up to the glory of the heavens. The underworld part of this story is an afterthought—a tiny grace note at the very end. 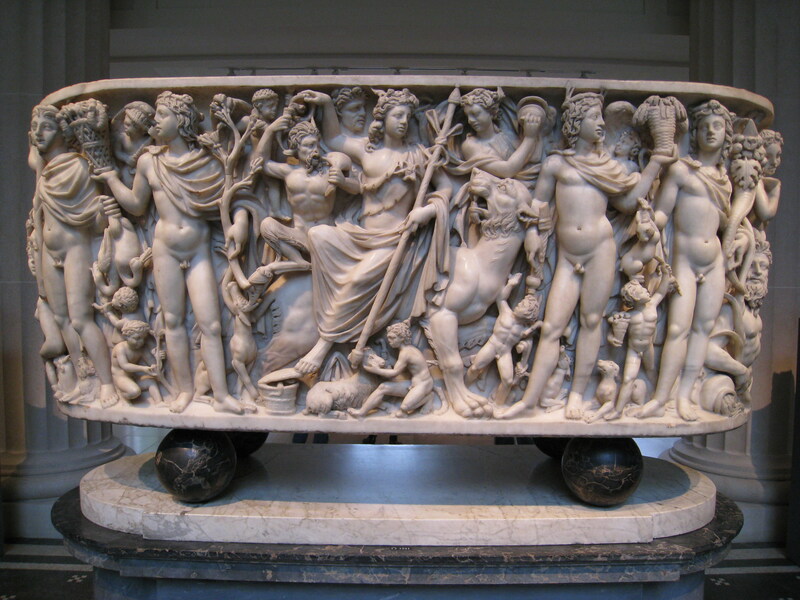 However it is worth remembering that Dionysus’ story runs through the world and the underworld. Drink and delirium are also keys to the realm of the dead, as any tragedian or hardened boozer could readily tell you. 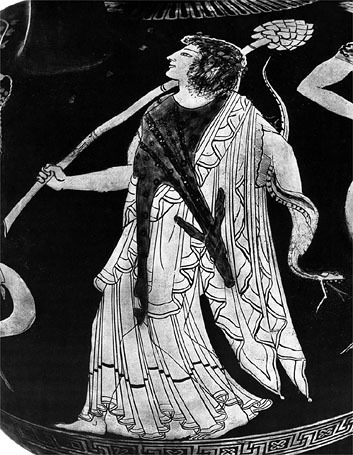 Today, to remind you to enjoy yourself on the long Labor Day weekend (and to take whatever joy you can from the dying summer) here are two images of maenads with snakes. I’m sorry they are such small images and that they are distorted from being glazed on non-three-dimensional surfaces of fifth century Greek vases. Still they are very beautiful. 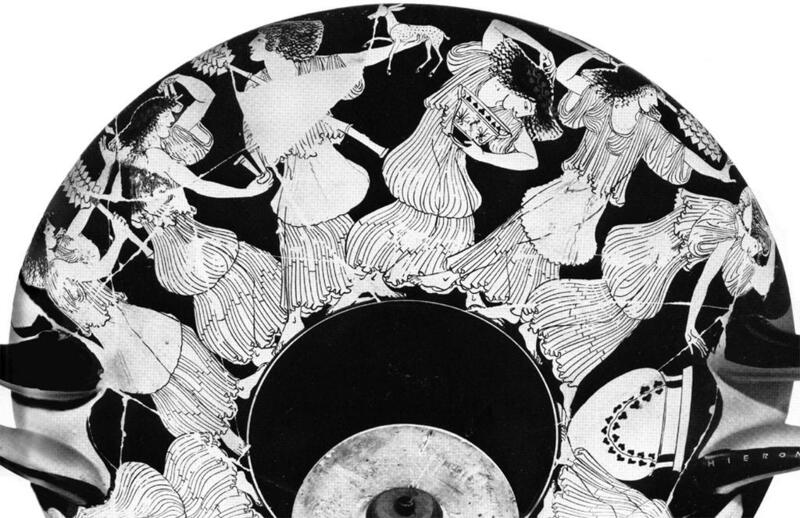 The maenads were attendants of Dionysus, god of wine, tragedy, and delirium. The constant drinking drove maenads to euphoric madness and they were quite dangerous (unless you could stay as messed-up as them). 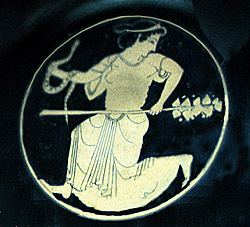 Each of the dancers holds a thyrsus—an sacred symbol of Dionysus which we’ll write about next week. Cheers! To life, fulfillment, and fecundity! 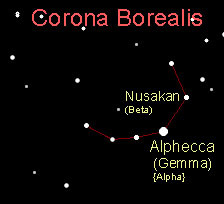 Corona Borealis is a semicircular constellation in the northern sky between Hercules and Boötes. It is of mild interest to astronomers for containing two interesting variable stars: (1) T Coronae Borealis, the so-called “Blaze Star”, which is a recurring nova binary star; and (2) R Coronae Borealis, a yellow supergiant which periodically dims from magnitude 6 to magnitude 14 and then brightens back up (possibly because it is producing carbon). The constellation is much more interesting to classical artists since a myth about its creation gives artists their symbol for deification. Ariadne was the daughter of Minos, king of Crete who became judge of the underworld after his death and Queen Pasiphae (who was herself a daughter of the sun). The princess fell in love with Theseus, an Athenian hero who was to be sacrificed to the Minotaur, a bull-headed monster who lived in the labrynth beneath the palace. With the help of the wise artificer, Daedalus, Ariadne rescued Theseus and together they fled from Crete (just barely escaping destruction at the hands of Talos, the giant bronze robot which guarded the island). 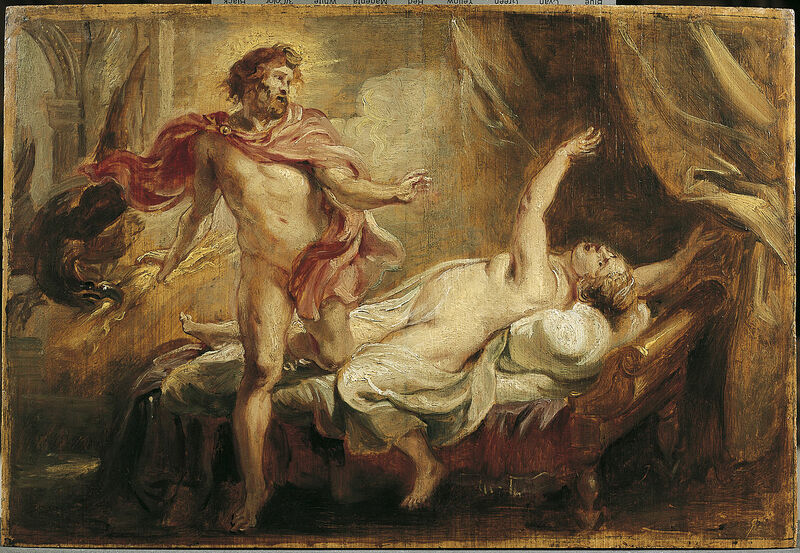 Once they had escaped, the faithless Theseus abandoned Ariadne sleeping on the island of Naxos. 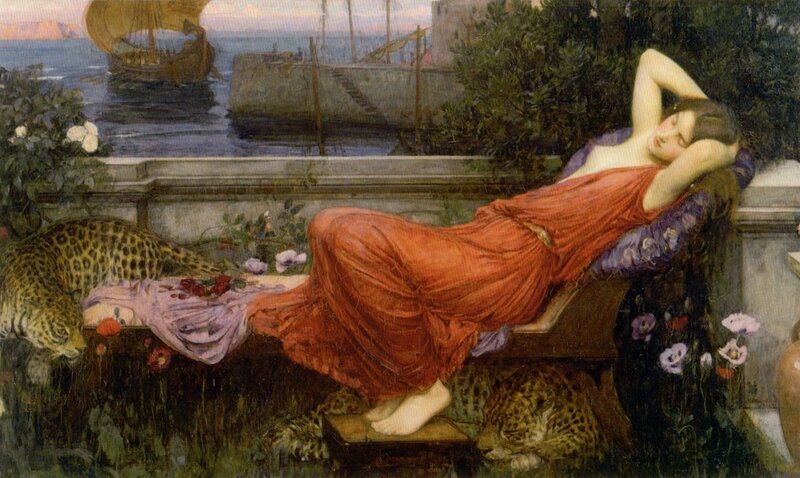 The sleeping maiden was spied by Dionysus who chose her as a consort. 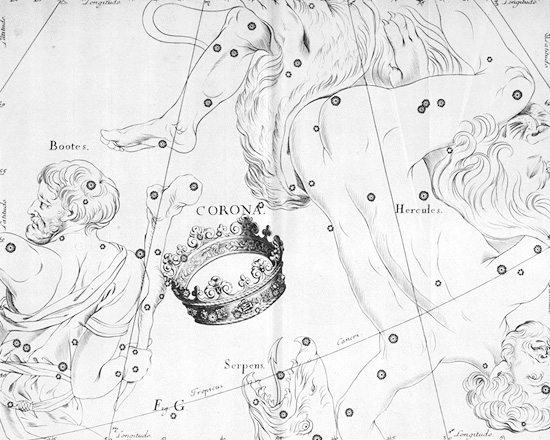 She was given immortality and godhood as soon as she was married and Dionysus hung her wedding crown of stars in the sky as the constellation Corona Borealis (maybe it has so many variable stars because it was sacred to the god of intoxication). This seems like a weird narrative and it probably reflects Greek confusion about the proper status of Ariadne (whom some scholars identify as a Cretan serpent goddess from the Mycenaean era). But irrespective of her origin or how she came by her divinity Ariadne has proven to be a favorite subject of visual artists from classical times onward. Many artists prefer to portray her beautiful, naked, and asleep (and you can easily find many such paintings and statues on the web) but nearly as many are fascinated by her apotheosis—the moment she receives her godhood and escapes mortality. 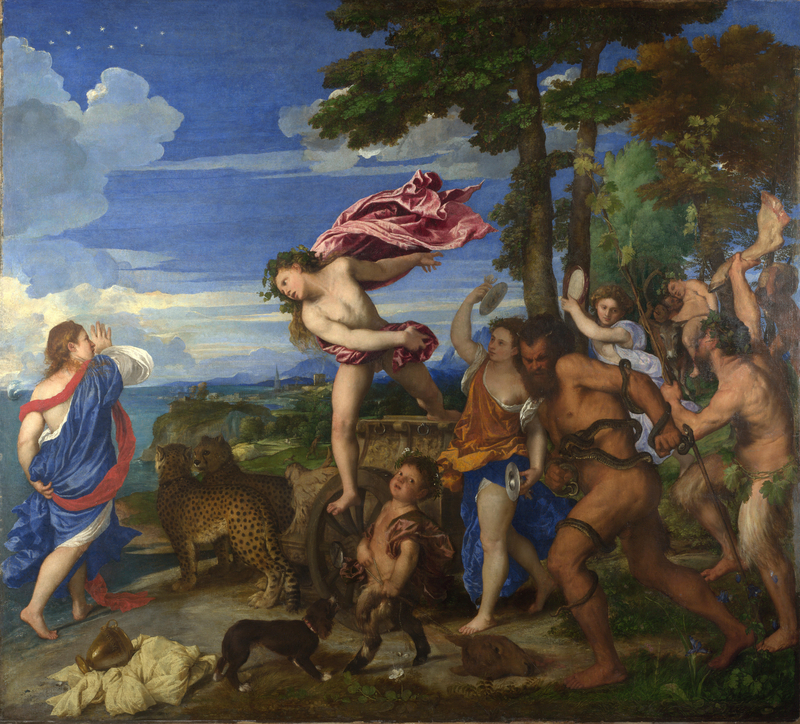 Perhaps the finest of these paintings was created by the peerless hand of Titian for the Alabaster Room in the palace of Duke Alfonso d’Este–who specifically commissioned the world’s finest bacchanal paintings for his room (a project so fascinating and strange that the Alabaster Room has been virtually created online). The painting shows the moment when Dionysus reveals himself to the bewildered Ariadne with all of his divine retinue. The beautiful god leaps from his leopard-drawn chariot and flies down towards her as maenads and satyrs wildly revel behind him. If you aren’t too distracted by the naked wild man covered in snakes, or by the dismembered donkey, or by the beautiful columbines and irises which bloom purple beneath the feet of the god’s inebriated followers, you will notice the constellation Corona Borealis glowing in the sky above Ariadne’s head. 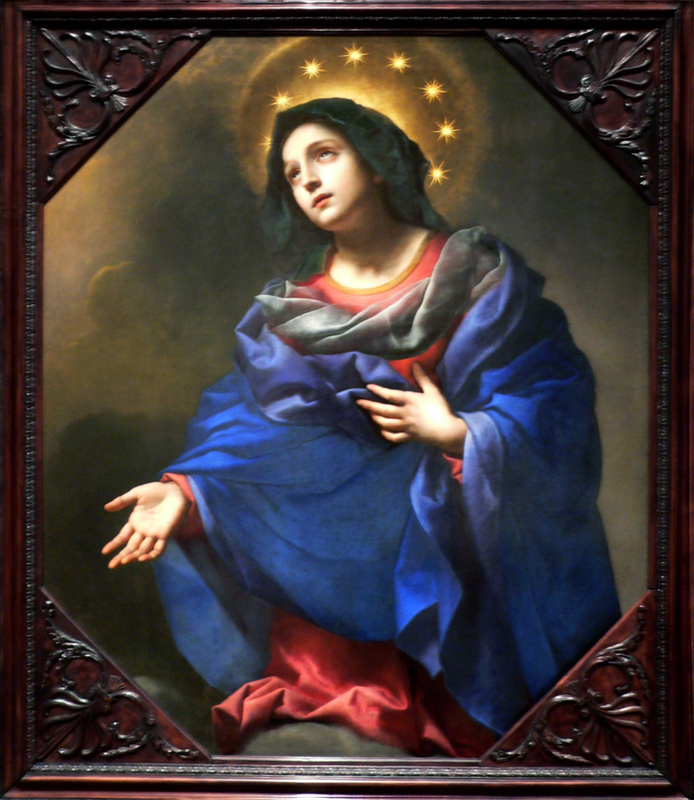 Titian’s vision was so splendid and influential that other artists adopted the crown of stars as a symbol of apotheosis. The crown of immortality appears in other works as heroes step across the threshold of godhood. It is a reoccurring representation of our desire to step beyond humanity and become deathless divine beings.